An elegant walnut and mahogany box with holes both in the lid and in the base is displayed. The interior is just large enough to hold a single playing card or business card, which when inserted will block all passage through the holes. A gleaming steel ball bearing completes the set. All items may be closely examined by the spectator, before and after the effect. 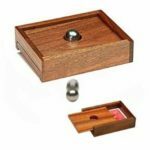 A freely selected card is placed within the box, the lid replaced and the ball bearing placed on top of the box. The box is now tilted from side to side until the ball drops into the hole in the lid. The ball remains suspended due to the card, but then suddenly begins to melt through, falling out the other side of the box! Remember that the card is visible throughout and there is no place for the card to hide within the box. There is nothing added or taken away. No secret locks to fumble with, and no secret sliding panels. Nothing for the spectator to find yet the steel ball visibly penetrates and everything can be immediately handed for examination. There is nothing like this Marbo-Card Penetration on the market today. Made of the finest quality walnut with mahogany accents. Manufacturing rights purchased from Jim Swoger, House of Enchantment.